Four men. One powerful bond. Rich, powerful, eccentric, Julien Bonds knows what each of his friends needs, and he’s determined to see they get it. 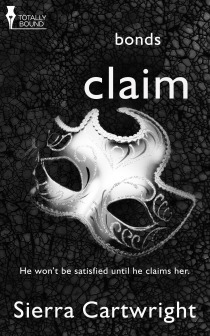 Claim is the 2nd book in Sierra Cartwrights Bonds series. You’ll find my review of the first book too on my blog and Goodreads. Where to start with this. I’m finding I’m having to write the blog for this quickly, because like the first book, once I put it down, its just not extremely memorable to me. It wasn’t a bad read, but just nothing stands out for me to keep my attention once I move onto other books. The story itself is rather good, and there were parts in it that full on made me chuckle. Kennedy Aldrich is a man of extreme focus. What he wants, he focuses all his attention on and does what needs to be done to get it. He -wants- Mackenzie, or Zee as he calls her. Aside from his crazy neon shoes that he wears, in a variety of color, he’s actually intense guy. You do get a feel of dominant when you read about him. I was a bit disappointed with him though, in the first book.. he come across like the insightful one, so when he messes up in this one, almost along the same exact lines that he gave advice about.. it just made me shake my head. I almost felt like he never let up, has to have control in all things but for me, it was missing that softer edge. You’re told he cares and you know the attraction is there, but his inner monologue goes on about wanting a caring relationship and since all I ever saw was the aftercare of the caring part, that didn’t say to me “I’m falling in love with this woman.” It just read to me as, “I’m possessive and I like what I’ve got. I’m keeping it.” I wanted to take a frying pan to his head a few times. Mackenzie is a woman coming out of a divorce. Her scumbag ex cheated her on her and basically the ink wasn’t even dry on their marriage certificate. That’s more than enough to screw with any woman’s head. So, she likes her life, and she likes being single. In fact, she wields the I’m single sword deftly, and deflects with the I’m single and loving it shield, often. It’s going to take a special someone for her, to break down those walls… and that some one is Kennedy. These two meet and it’s like an insta-lust smoothie with a side of spanking. Then you find out that they’ve met before, if briefly but it wasn’t on this level and was before she was even divorced. He didn’t know she was submissive.. and you can’t miss his reputation, so she did know he was a dominant. It just wasn’t their time. My problem started here.. they have great chemistry, as I stated before, but chemistry and love connection just aren’t the same. I didn’t feel -both- in this. I knew it was there, but I didn’t feel it from the characters. Sometimes you’ll get a one liner, like this.. But it’s effect is pretty much instantly ruined by his inner dialogue and his noting to himself that it’s for someone elses benefit. It pretty much ruins the actual “I care connection” for me. The only time it seems they do connect, emotionally, is when they are doing scenes. But that is literally the -only- time I noticed it.